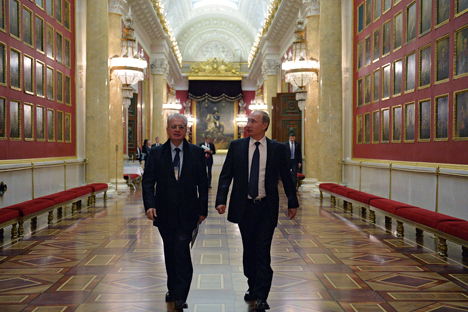 Russian President Vladimir Putin, right, and Director of the State Hermitage Museum Mikhail Piotrovsky during the president's visit to the museum. Russian President Vladimir Putin presented the Hermitage State Museum with a clock and a Faberge egg clock and expressed hope that the works of art will be displayed for visitors to admire. “I would like to present a clock by Carl Faberge and an egg clock – a second work by Faberge – as a gift to the Hermitage,” the president said during a visit in honor of the Hermitage’s 250th anniversary. The first item is a clock made for the 25th wedding anniversary of Tsar Alexander III and Tsarina Maria Fedorovna. The Faberge egg clock was a “Rothschild egg clock,” Putin said. “I hope they find a place in the Hermitage’s exhibitions,” he said. Putin said that the priceless items on display at the museum are a point of pride not only for Russia, but for the whole world. They were preserved and protected during the most difficult periods of Russian history. “It is hard to imagine that 250 years ago, the museum’s collection began with 225 paintings bought from abroad by Catherine the Great, and now it houses more than 3 million works,” Putin said. The State Hermitage is an attraction for millions of people from both Russia and abroad. “The Hermitage organizes dozens of various programs that can be considered benchmarks for modern museology. I will particularly note the museum’s outstanding website. It is a wonderful initiative that allows millions of people from around the world to experience masterpieces of global art without leaving their homes," Putin said. Regional branches of the Hermitage will also become nationwide centers of attraction, according to statements made by the Russian president at a reception marking the 250th anniversary of the Hermitage. “Mikhail Borisovich [the Hermitage’s director Mikhail Piotrovsky] and I were talking about creating small branches of the Hermitage in other Russian cities, such as Yekaterinburg, Omsk, and Vladivostok. The plans exist, one way or another, and all plans move forward,” Putin said.